The “dog days” of summer have come and gone. But that doesn’t mean it has to end! ….Actually it does. 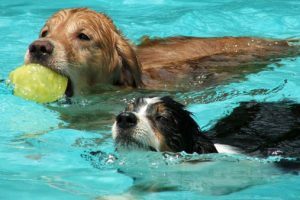 Bring your dog for the once-a-year swim in the outdoor pool. Sorry, owners aren’t allowed in the water. Register at the front desk in advance or you can register the day of. Go to the back of the facility to enter the outdoor pool. Dogs need to have their collars on at all times. Please be courteous and clean up after your pets.